The Natuna Islands are a 272-island archipelago of Indonesia, located in the Natuna Sea between east and west Malaysia and Kalimantan. The islands are officially part of the Riau Archipelago Province. Natuna is one of the northernmost island groups of Indonesia. The main islands of Natuna Archipelago are Natuna, South Natuna and Tambelan. The South Natuna group comprises the islands of Serasan, Panjang and Subi. The Anambas archipelago, located several hundred kilometers to the west and comprising Terempa, Matak and Jemaja Andriabu Island, are also sometimes included in the Natuna Islands. Natuna can however offer unspoiled beaches and a landscape and a culture that is absolutely worth a visit. The islands are known for lovely woven textiles and their traditional dance. The Natuna islands are spread over a wide area, located in the South China Sea between east and west Malaysia, Kalimantan and Singapore. The main groups of islands are Anambas to the west, Natuna, south Natuna and Tambelan. One of the largest natural gas fields in the world has been found here, The Natuna gas field in the North and South Natuna archipelago is believed to have 222 trillion cubic feet of natural gas in reserve, 46 trillion of this can be recovered. In the future the Natuna Natural Gas Project will be very important for Indonesia’s economy. The Natuna Islands have a remarkable avifauna with 71 species of bird registered, including the near-threatened Lesser Fish-eagle, the Natuna Serpent-eagle or the rare endemic Silvery Wood-Pigeon. Among other species endangered species, we find the Green Iora, the Brown Fulvetta or the Green Broadbill. Natuna Besar (or Ranai) is the largest and northernmost of the islands and also one of the northernmost points in Indonesia. Here we can find lovely corral reefs and a large variety of fish. The population is relatively small, but some people have been moved here by the government from other islands in Indonesia and grow products like peanuts and peas. 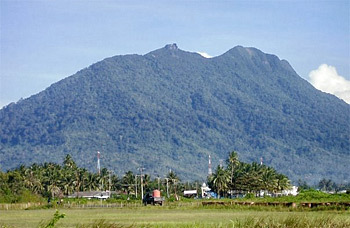 Mount Ranai, the highest mountain in Natuna archipelago at 1.035 m, is located on this island. There are some great areas for diving here, the waters of the South China Sea around the island can offer an unique underwater world, the coral is normally found within five to ten meters below sea level and 50 to 750 meters from the shore. Smaller islands like Senoa to the northeast can also offer white beaches and coral reefs, Panjang to the northwest is known for the protected green turtle, and can be reached by boat from Natuna Besar in 30 minutes. Totally there are about 20 small islands surrounding Natuna Besar. South Natuna is located between Natuna Besar and the Kalimantan mainland, the main islands here are Serasan, Panjang and Subi. The islands have a strong surf and impressive scenery.